This comfortable beach front home is just a few steps from the sand and water, with stuffing views! You will enter this home from a small open deck facing Palmetto Blvd into an entry room that has the washer/dryer, utility closet and plenty of space for coolers, etc. This home has a central living, dining, and kitchen combination with 2 bedrooms and a full hall bath (tub/showers) on either side. A large screen porch with plenty of rockers stretching across the front of the house facing the beach. This is accessed from the living area of the home. An open deck is beyond the porch and practically sits on the beach! The master bedroom is on the right side of the house with beach views, a queen size bed, and TV. The street side bedroom on this side has a double and a single bed (no TV). The left side of the house has a bedroom facing Palmetto with 2 single beds and a TV. The front beach view bedroom has 2 double beds (no TV). 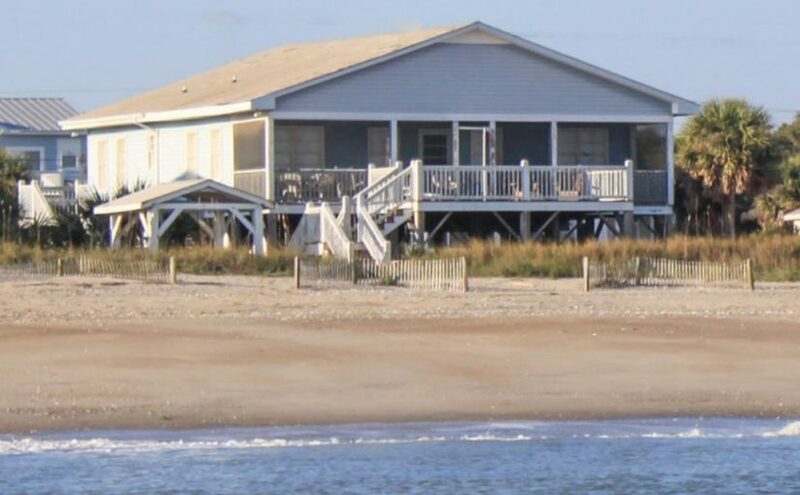 ‘Carolina Blue’ is a popular home for Edisto Beach vacations. Cable TV & Internet service is available, Charcoal Grill located under the house. Pets allowed at this property for an additional non-refundable (plus tax) pet fee. Boat Slip available for an additional fee. Located at the Edisto Marina, please inquire for details.